After running into each other in the midst of an ensuing zombie apocalypse, Tom and Bunny Save the World's titular duo band together and embark on a riotous road trip from London all the way up to Yorkshire, an apparent safe zone. Tom's a nerdy Tom Trumps enthusiast, whilst Bunny's a boisterous teacher trying to deal with the guilt of sleeping with her girlfriend's dad. Tom's packed a survival kit, Bunny's packed a baseball bat in a sling. As an apocalypse facing team, they're a bit of an odd match, but that's what makes them such perfect heroes in this very 2018 zombie epic from Fat Rascal Theatre. Zombie pop culture aficionados, will notice plenty of lovingly borrowed plot points from some of the the most well known properties of the 2000s slipped seamlessly into this kooky hour long supernatural extravaganza. It borrows its zombie epidemic origin story from 28 Days Later, there's a hunt for a cure a la the first season of The Walking Dead, Zombieland's survival tips are reworded (panic stricken public are advised "never assume your zed is dead", a tip which anyone in an end-of-the-world situation would do well to remember), and of course, the humour and bizarreness of the definitive zom-com, Shaun of the Dead, is at the heart of the piece. As the musical comedy's eponymous survivor, Robyn Grant is hilarious and totally believable, with her carpe diem attitude and no nonsense survival plan. Grant, who is also responsible for Tom and Bunny Save the World's laugh a minute book and lyrics, is undoubtedly one to watch, with a killer voice and whip smart comedic timing perfectly suited for musical comedy. Jamie Mawson is equally entertaining as Bunny's fumbling foil. With his priceless expressions and equally skillful vocals, the audience will be rooting for Tom despite his obvious ineptitude. But they're not alone on their quest. Tom and Bunny are joined by farmhand Gareth, a vet and fellow northerner who Bunny takes an immediate shine too, as well as Pearl, a pregnant science professor, and Kai, a gruff military figure with a mysterious past. And watching from a secret facility somewhere in Scotland is Mike, a man charged with nuking the country if things get too out of hand. Dramatic stuff! 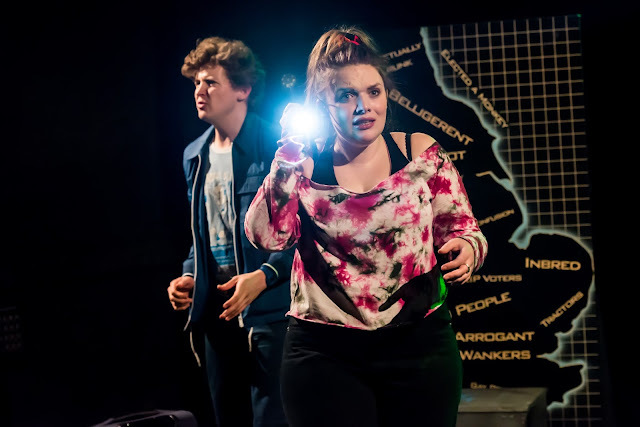 Based on their previous productions, if there's one thing Fat Rascal Theatre excels at especially well it's injecting truly hilarious comedic situations with apt social commentary, and Tom and Bunny Save the World is no exception. The musical comments on the very real class divide which is always making headlines, and is at the forefront of many minds at this particularly politically rocky time, but still manages to deliver plenty of oddball humour to keep the tone light throughout. There's never a dull scene in Tom and Bunny Save the World. Even one of the musical's most gasp inducing moments, when Luke Dunford's Gareth reveals that he has been bitten by a zombie and doomed to a fate worse than death, also doubles as one of its funniest. The image of Gareth's limbs twitching as he bemoans Bunny's rejection of his romantic advances whilst transforming into a brain eater is one of the musical's most uproarious moments. The musical's ending arrives quite abruptly, teasing its audience with an intriguing cliffhanger which cries out for a sequel. 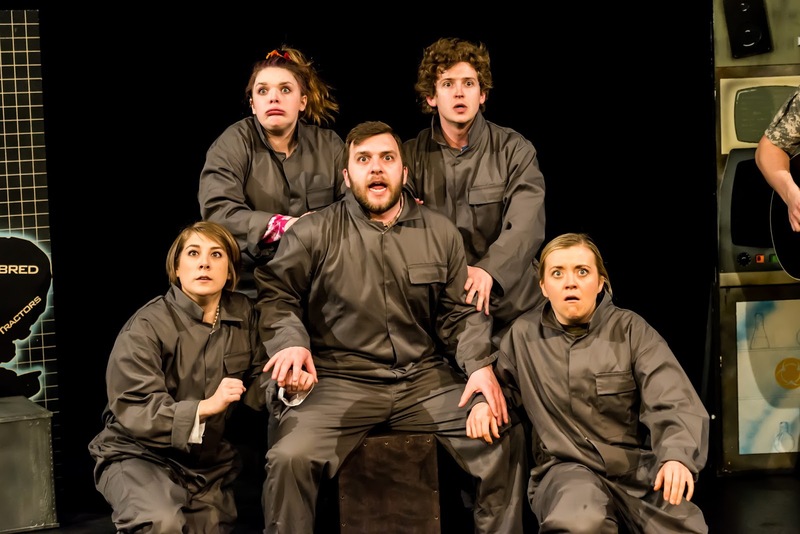 Tom and Bunny Save the World provides unrelenting mayhem and brilliant fun, delivered by an enthusiastic cast of comedians who never miss a beat. For sharp musical comedy, you can't do much better than this!